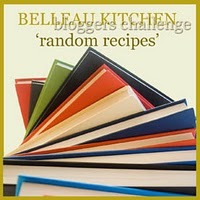 Dom is celebrating the second birthday of Belleau Kitchen, his superb food and cooking blog. So Random Recipes #15 has gone all cakey- bakey in a birthday kind of way! 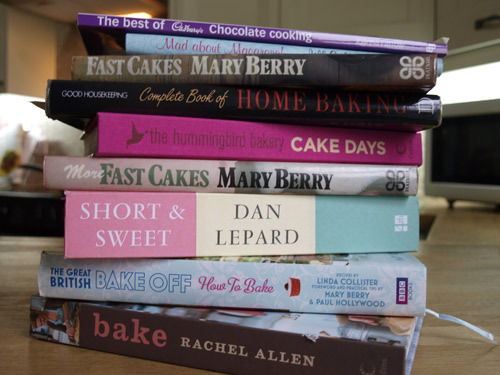 I piled up a selection of my baking books, praying that the macaron book would not be the one picked, anyway I needn't have worried because the random number picker chose #1 which is The Best of Cadbury Chocolate Cooking. 1. Line a 500g loaf tin with clingfilm. Crush the biscuits into small pieces. Put them in a bowl and pour over the liqueur. 2. Melt the chocolate and half the cream. Cream together the butter and sugar until pale and fluffy. Stir in the chocolate and cream mixture, then the remaining cream. 3. Spoon about one third of the chocolate mixture into the tin. Scatter half of the biscuit pieces over the top. Spread half of the remaining mixture, then add the remaining biscuits. Finish with the remaining chocolate mixture. 4. Chill the chocolate cake over night until set. Invert on to a plate and peel off the film. 5. You can decorate by creating scribbly lines with melted chocolate piped across the top. Or you can just slice and serve because it's quite rich enough as it is! 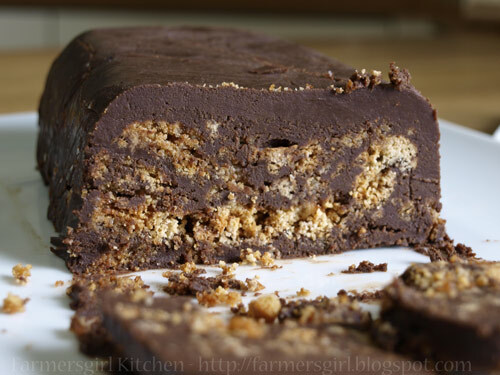 This is totally indulgent, rich and needs to be served in very small slices. 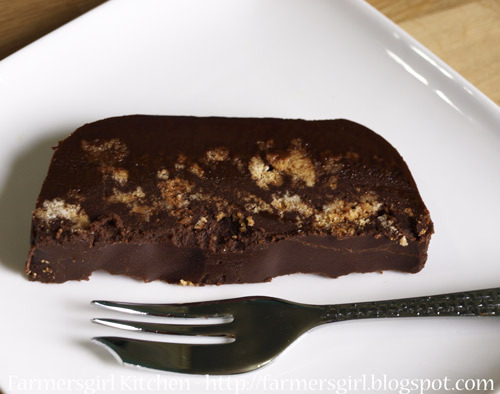 If I made it again, I think I would simply mix the biscuits into the chocolate, because it does tend to crumble a bit when you cut it. The liqueur comes through strongly so it's a grown up slice, but you could use orange juice and if you don't like almond flavours at all, then other crunchy biscuits like gingersnaps would probably work just as well. Oooh, looks good. I'm liking the idea of ginger biscuits instead. Could add some chopped crystallised stem ginger too - yum! Thanks Caroline, yes crystalised ginger would work well with the gingersnaps. I haven't forgotten the award, just been mega busy this weekend. I love amaretti and amaretto - so gotta make this! Yes, please! I would take more than ONE slice of this little treat! I'm sure you're right about needing to serve very small slices but it'd be hard to restrain myself. I have my grandmother's copy of this cadbury book somewhere and must hunt it out. I love the look of this cake! I bought amaretti biscuits with the intention of making ice cream. I saw this recipe this morning and well, we won't be having ice cream now! I had no orange juice so I used brandy. It looks and smells incredible. I'm just keeping my fingers crossed about the brandy. It should be ok, shouldn't it? Let me know how it is once you've tried it. Oh wow this would be perfect for WeShouldCocoa this month. Amaretti, almonds, Amaretto.You must have read my mind!